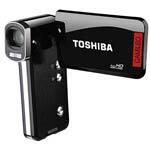 Zoom in without losing your focus Zero in on the quality and creativity you crave with Toshibas CAMILEO P100 Full HD Camcorder, offering advanced optical Zoom, pocket-size convenience and more. This uniquely styled camcorder is thin, compact and light. Yet it really weighs in when it comes to recording lifes memorable moments, offering 1920 x 1080p full HD video resolution, 16-megapixel interpolated stills, and 5x optical or 8x advanced Zoom. Advanced Zoom extends optical Zoom to create a superior image than traditional digital Zoom. The result is a close-in image that truly captures the essence of the shot you want. Now youll never worry about losing detail when you swoop in to see your babys smile, the look on their faces when they open your gift or that object off in the distance.